Akshay Kumar's last trip west was in the 2007 Bollywood hit Namastey London. He played the provincial but lovable Punjabi boy, Arjun, who eventually won the heart of the British Indian leading lady with his desi values and pride. The movie did very well overseas, making a particular impact in the U.K. and U.S.
Less than two years later, Kumar’s globetrotting is taking a different turn. This time, Kumar's road west goes through China. 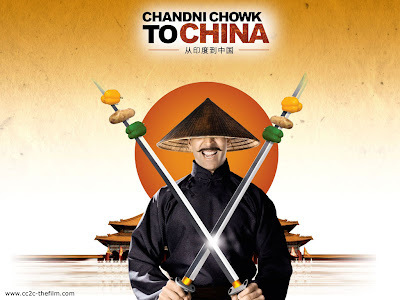 Warner Bros. co-produced its first Hindi film, Chandni Chowk to China, and released it to 131 theaters in the U.S. and Canada on January 16. The story is similar to that in Namastey. Kumar plays a silly and superstitious vegetable cutter from the famous Delhi market, Sidhu, who wins the heart of the glamorous heroine Sakhi (Deepika Padukone who made her debut in Om Shanti Om), except this time he does it by learning kung fu. Gordon Liu, most famous for his role as a martial arts monk in 36 Chambers of Shaolin, is cast as the villain, Hojo, a vicious boss who terrorizes a village by killing people with his hat. The villagers believe that Sidhu is the reincarnation of the mythological warrior Liu Sheng, and bring him to China to battle Hojo. At the same time, Sakhi discovers that Hojo abducted her long-lost twin sister, Meow Meow (also played by Padukone), and that her Chinese father, who becomes Sidhu's kung fu master, is still alive. In short, the plot is an indulgent combination of every slapstick storyline screenwriter Shridhar Raghavan and producer Ramesh Sippy could think of. But plot is not really the driving force for the 168-minute comedy. CC2C -- Bollywood fans lovingly abbreviate the titles of movies -- capitalizes on a growing interest in the over-the-top drama and dance of Bollywood and the universal truth that every great movie has a kung fu training sequence. But the potential for disaster was huge. For how often India and China are put together in sentences about globalization and growing economies, most people in both countries know surprisingly little about each others' lives. So far, India's most significant pop culture connection with China is gobi manchurian, the ubiquitous Chinese dish of India that isn't actually Chinese. So the fact that the CC2C movie poster -- which was created before the film -- features Kumar wearing a straw paddy field hat in front of a rising red sun did not bode well for China enthusiasts looking for a new perspective on the far far east. CC2C is Bollywood's first foray into China, but it is not a deep reflection on Chinese-Indian relations. Moviegoers who approach it that way won't enjoy CC2C any more than they would gobi manchurian. Still, CC2C paints a decent portrait of Indian people's day-to-day relationship with their East Asian neighbors: Martial arts are cool, China makes a lot of electronic goods (in this film, they mass produce translating earpieces and flying umbrellas) and the Great Wall is a really big tourist attraction. Then it digs a bit deeper, calling on Wong Kar-Wai-esque Hong Kong glamour (which could be an excuse to put Padukone in a qipao) and creating the Bollywood version of a Forbidden City mega-scene. And for all of the film's unabashed stereotyping of Chinese villagers and kung fu masters, it is surprisingly not insulting. Even Sidhu is a parody, with his pencil thin mustache and devotion to a potato that looks like the Hindu god Ganesha, and, though there is a character named Chopsticks (Ranvir Shorey), he is an Indian guru hack. CC2C is self-aware of its absurdity, which makes its absurdity forgivable. And often very entertaining, even if it is predictable and long-winded. (For the abridged version, see the CC2C YouTube channel). CC2C had a disappointing $650,000 opening in North America; Kumar's last film released here, Singh is Kinng, took in $1 million, perhaps owing to the movie's repetitive but catchy title tune, a surprising East-West rap collaboration. Notwithstanding the spectacle of Bollywood going to China, maybe the best way west is still through Snoop Dogg.